Common exhaust duct not shared by fans in separate dwellings. Install separate exhaust ducts for separate units. Each outlet must have a back-draft damper to prevent cross-contamination when the fan is not running. ENERGY STAR Certified Homes (Version 3.0, Revision 07), Exhaust outlets from more than one dwelling unit may be served by a single exhaust fan if the fan runs continuously or if each outlet has a back-draft damper to prevent cross-contamination when the fan is not running. See the Compliance Tab for related codes and standards requirements, and criteria to meet national programs such as DOE’s Zero Energy Ready Home program, ENERGY STAR Certified Homes, and Indoor airPLUS. Exhaust fans should always be ducted to a location outside the home (See Kitchen Exhaust and Bathroom Exhaust). Ideally, each exhaust fan should have its own individual duct to the outside and each unit should have its own ducting to prevent cross contamination. 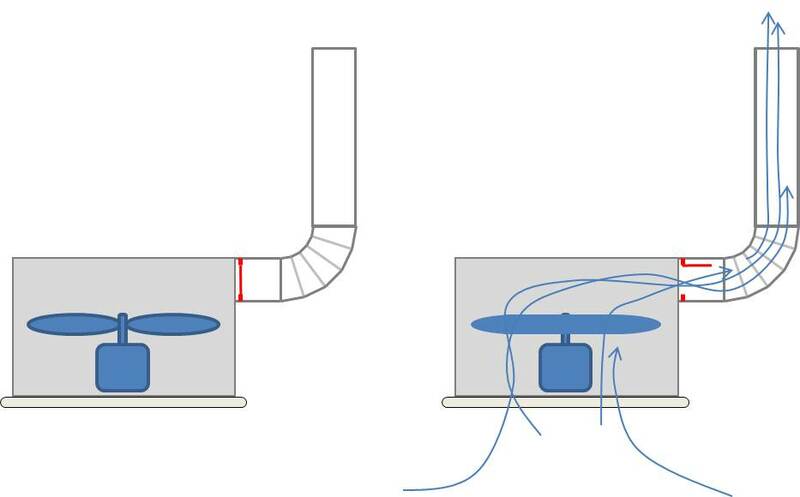 However, in multi-unit dwellings, such as condominiums or townhouses, builders sometimes prefer to connect the exhaust fans to a common exhaust duct, for reasons of layout or a wish to minimize penetrations through the roof (See Back-Draft Dampers at Shared Common Exhaust Duct). ENERGY STAR permits multiple units to share a common exhaust duct if each fan has a back-draft damper to prevent cross-contamination when the fan is not running or if all fans connected to the common exhaust duct are set to run continuously. 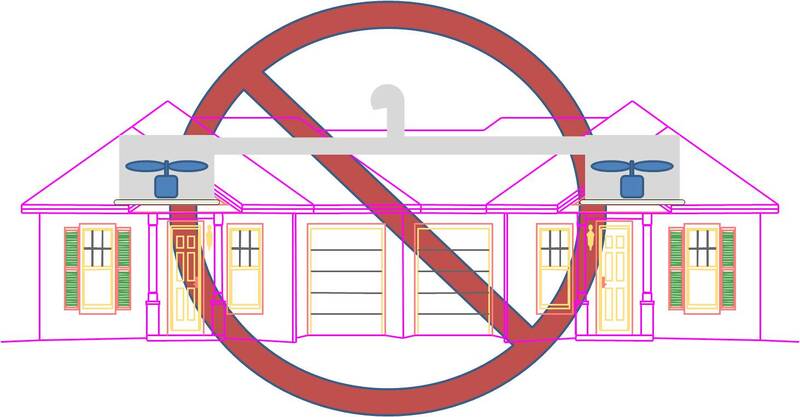 Figure 1 - Exhaust fans in separate dwelling units should not share a common exhaust. Install back-draft dampers where the exhaust duct meets the exhaust fan in each unit. The dampers should open when the fan is actively exhausting and should shut when the fan is off. When the exhaust fan is operating, the back-draft damper is pushed open by airflow to allow air to exit through the exhaust duct. Figure 2 - Exhaust fans in separate dwelling units can share a common exhaust if each exhaust fan is equipped with a back-draft damper to prevent cross contamination. Remember to remove any packing tape used to hold the dampers closed during shipping. Figure 3 - The back-draft damper is open when the fan is actively exhausting and closes when the fan is off. In multi-unit dwellings, such as condominiums or townhouses, the HERS rater will inspect the ventilation system exhaust ducts to ensure that one of the following is true: 1) each unit has its own exhaust duct that is individually ducted to the outside, or 2) if the units share a common exhaust duct, all of the fans are set to run continuously, or 3) each fan outlet has a back-draft damper to prevent cross-contamination when the fan is not running. No climate specific information applies. The Compliance tab contains both program and code information. Code language is excerpted and summarized below. For exact code language, refer to the applicable code, which may require purchase from the publisher. While we continually update our database, links may have changed since posting. Please contact our webmaster if you find broken links. ENERGY STAR Certified Homes (Version 3.0, Revision 07), HVAC System Quality Checklist, Local Mechanical Exhaust. Common exhaust duct not shared by fans in separate dwellings. Exhaust outlets from more than one dwelling unit may be served by a single exhaust fan if the fan runs continuously or if each outlet has a back-draft damper to prevent cross-contamination when the fan is not running. Exhibit 1: Mandatory Requirements. Certified under ENERGY STAR Qualified Homes Version 3. This topic is not specifically addressed in the IECC. Section M1507.2 Recirculation of air. Exhaust air from bathrooms and toilet rooms to not be recirculated within a residence or to another dwelling unit and must be exhausted directly to the outdoors. Exhaust air from these rooms cannot discharge into an attic, crawl space or other area inside the building. Section M1505.2 Recirculation of air. Exhaust air from bathrooms and toilet rooms to not be recirculated within a residence or to another dwelling unit and must be exhausted directly to the outdoors. Exhaust air from these rooms cannot discharge into an attic, crawl space or other area inside the building. This section shall not prohibit the installation of ductless range hoods in accordance with the exception to Section M1503.3. Appendix J regulates the repair, renovation, alteration, and reconstruction of existing buildings and is intended to encourage their continued safe use. Access to some references may require purchase from the publisher. While we continually update our database, links may have changed since posting. Please contact our webmaster if you find broken links. Standard requirements for DOE's Zero Energy Ready Home national program certification. Standard document containing the rater checklists and national program requirements for ENERGY STAR Certified Homes, Version 3 (Rev. 7). *Publication dates are shown for formal documents. Dates are not shown for non-dated media. Access dates for referenced, non-dated media, such as web sites, are shown in the measure guide text. The following authors and organizations contributed to the content in this Guide.